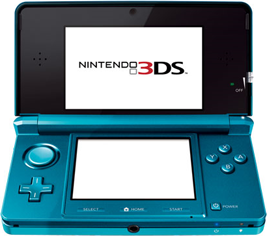 A list of Nintendo 3DS systems and accessories. The Nintendo 3DS is also compatible with many Nintendo DS accessories. The Nintendo 3DS is a clamshell design the same size as the Nintendo DSi. The bottom half contains a standard touch screen with 6 face buttons, 2 shoulder buttons, a + Directional Pad and an analogue "nub" for more accurate control, plus Home and Power buttons. The Start, Select and Home buttons are all integrated into the border around the screen. The top half features a widescreen capable of displaying stereoscopic 3D images, as well as one camera above the screen and two cameras facing outward for taking 3D images. To the right of the screen is a slider control for altering the depth of 3D effect. 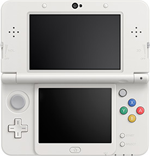 The system accepts Nintendo DS and 3DS games, and features an SD Card slot for saving data. A special edition Nintendo 3DS with larger screens and a longer battery life. The screens are approximately 90% larger than those on the standard model while preserving the same resolution. The battery lasts between 3.5-6.5 hours when playing a 3DS Card, and 6-10 hours when playing a Nintendo DS Card. To keep manufacturing costs down, the system didn't come packaged with an AC Adapter in Japan or Europe. 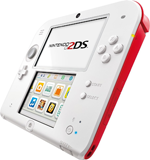 The Nintendo 2DS system is designed for younger players. The stereoscopic 3D effect has been removed entirely, to avoid concerns that this can damage the eyes of developing children. The system also eschews the clamshell design in favour of a sturdier, but bulkier, wedge-shape. A new generation of Nintendo 3DS, with improved processing power, integrated support for Nintendo's range of Amiibo figures, and customisable faceplates. Not a generational leap for the hardware, although some games may only be compatible with the New Nintendo 3DS. The system launched in Japan in 2014, with a launch planned for the U.S. and Europe in 2015. A large-screened New Nintendo 3DS, released on the same day. It features all the same features as the smaller-screened version, and even uses the same customisable faceplates. An add-on for the Nintendo 3DS that provides a second analog joystick and an extra set of shoulder buttons. The Circle Pad Pro was developed as a response to third party developer requirements for more complex control methods for 3D games. Only one Nintendo game is compatible with the Circle Pad Pro: Kid Icarus Uprising. A separate Circle Pad Pro design is available for the larger Nintendo 3DS XL. A collapsible stand for the Nintendo 3DS, packaged with Kid Icarus Uprising. The stand is designed to provide more comfortable play, by allowing the user to have both hands free to control the game with the buttons and touch screen. 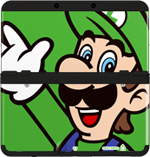 Swappable faceplates for the New Nintendo 3DS systems. They are available in a wide range of designs, from simple shapes through to Nintendo characters. Over 50 designs are available as of November 2014.